Finally got the time to post another recipe 🙂 a new one at that. I have never before cooked eggplant. I actually tried eggplant for the first time a couple of months ago! For some reason it just never appealed to me. I am happy to say I now like eggplant… well anyways back to my eggplant recipe experiment. I starting looking online for recipe ideas… I found a couple but nothing that just really stood out. So I just combined a few and created my own Eggplant Parmesan version. Here it goes! First you want to prep all your veggies. Cut them into small cubes. Next you want to prep your coating for the eggplant. You will need two bowls. 1 for your dry ingredients and 1 for the egg wash. In the dry ingredients just add your rosemary, salt, pepper, Italian seasoning and of course the almond flour. In the egg wash bowl just simply whisk the egg till blended. Now your going to pat your eggplant slices in the coating mix and then dip it in the egg wash and then pat it back into the coating mix. Your eggplant slices are ready for pan frying! Before we pan fry our eggplant slices lets start the sauce. 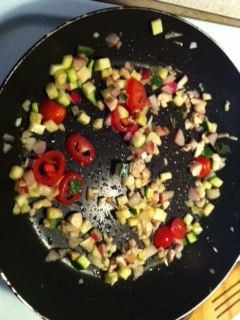 In another pan, put a little olive oil in it and saute your veggies. Throw in the garlic and onion first. Let that saute for a couple of minutes then add in your other veggies. After a couple more minutes throw in the meat. Let the meat cook fully then add your tomato sauce. Reduce heat and simmer. Add some more Italian seasoning, salt and pepper if you like. coconut oil another pan. Let it melt then add your slices. I didn’t really time this part. I just used my best judgement. About 8 mins. on each side. Now I added some goat cheese on the top of my slices before I flipped them. This created a cheesy crust when done. This is optional. All you have left is to put all this goodness together into one big pile of uber goodness. 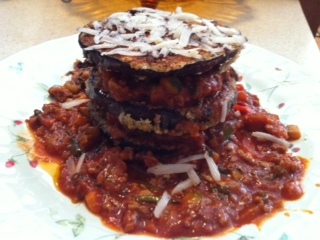 All you do now is stack the eggplant slices and put the meaty sauce mixture in between. Any left over mixture just add around the sides. 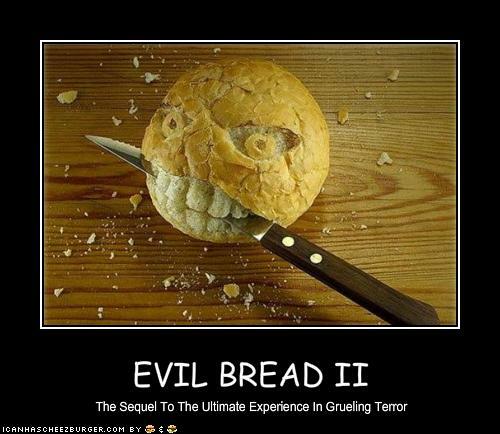 You’ll definitely be eating it later. 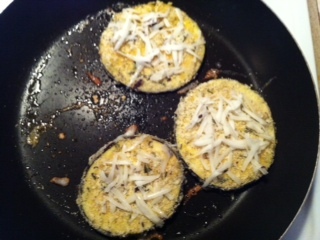 Then walla you have a 5 star looking eggplant parmesan and a healthy one too! So enjoy guilt free! So I had another consultation with my ND last week. So far, all my syptoms have improved. Better energy, less or nonexistent migraines, clearer skin, etc… the only thing though is my food cravings and hunger issues (which could be a side effect of my hormones going crazy after finally stopping the pill after 8 years, no no not to get preggo but in an effort to get off all medication) She recommended eating half an avocado in the morning and the other half after lunch. There is only one problem… I am not very found of avocado. It helps my hunger though… probably because the taste is a turn off lol but just like many other things I will get accustomed to the taste in time. But there is hope for now! 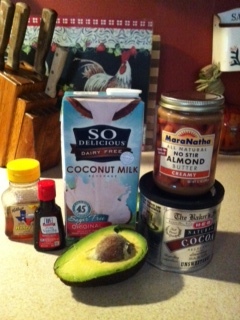 I was doing my yoga yesterday on myyogaonline.com and saw an article about avocado pudding. The thought was unappealing but the picture looked delicious. So this morning I thought, what the hell, what do I have to loose. Well after a few seconds of looking at my concoction I took my first bite. It was pretty delicious! The sweet flavors and chocolate mask the avocado taste. So overall it was a success. Here is my modified version of the recipe. 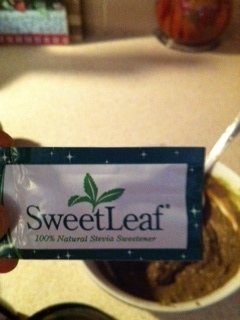 Stevia and the honey are the sweeteners. I found that I needed the stevia but you don’t have to add it. Taste and add to your liking. Then enjoy! This is my first time ever trying turnips, that I can remember anyways. Both of these are new recipes I am trying out. I usually wait for the weekend to try new things since I have the time. Keep in mind most of my recipes are for a single to 2 person serving size. Preheat your oven to 350 degrees. 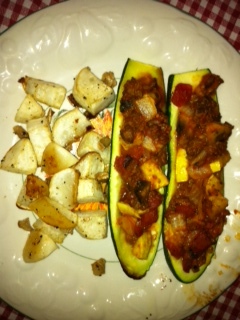 Cut your zucchini in half, long ways, or as teacher like to call it hotdog style. I was a teacher at one point! Next take a spoon and scoop out the zucchini insides but leave some. Don’t scrap all the way to the skin. Place them face down on a cookie sheet and cook in the oven for 15 mins or till slightly tender. While you zucchini is cooking, heat your skillet to medium high heat. Add your coconut oil. Next add your onions, meat, squash and mushroom. Cook until meat is fully cooked. Then add your marinara sauce. Let it simmer for about 3 – 5 mins. Your zucchini should be ready by now. Take our your little boats and fill them with the mixture you just cooked on the stove. Then place the boats back into the oven for another 10 mins to let everything simmer and for the zucchini to be completely cooked. Now take them out of the oven and enjoy! This could be a good way to get children to eat summer squash. I also wanted to add cut up carrots to the mix but was out at the time. Next time I will definitely add that. Also, try to find a marinara sauce that has chucks of tomato. I found that this adds a nice texture. Whoa, whoa, that is in grains? Turns out so! But why are they there you ask? 2 words… Defense Mechanism. I know that this sounds funny but hear me out. What do all living things want to do the most? Thrive, survive and reproduce. From what I remember from biology in high school and college, grains are plants… plants are living things. In order to survive, thrive and reproduce, living things develop defense mechanism to survive. Anti nutrients are plants’ defense mechanisms. So what does this mean to humans when they consume anti-nutrients? So there are 3 harmful anti-nutrients in grains – letchins, gluten and phytates. Each one has their own ways they fight back when consumed by humans. Phytates -If that was bad enough here is one more to add to gains defense mechanisms. “Phytates make minerals bio-unavailable(so much for all those healthy vitamins and minerals we need from whole grains! )” This includes calcium, can you say osteoporosis? Yes, I know this is a-lot to take in and really goes against everything we grew up knowing about grains but really think about this. We have a rising epidemic of obesity, cancer and other diseases. Obviously we need to take a step back and really think about what we are fueling our bodies with. Ultimately, you have control over what you eat. Don’t just believe everything you hear. Find out for yourself and make an educated decision. You only get one body, make sure you treat it right. On a personal note, I’ve been off grains for 2 months now… okay on occasion I’ll have a beer or some chips and salsa but grains are by no means a part of my daily intake of food. As a result, so far my acne has cleared, my oily skin is under control, my headaches are almost non existent, my fatigue has diminished and my moods have improved. During the past 2 months I have also been taking supplements to support my kidneys and adrenal glands but without a well balanced diet I don’t see how that could of improved all my syptoms. If you are not feeling your best, I challenge you to limit your grain intake. I really recommend reading the articles below for a better understanding of my blog topic. This post just scratched the surface. There are books and tons of articles just on grain consumption and it’s effects on our bodies. Last night we house sitted for my parents while they went out of town. For a late dinner we decided to BBQ. Luckily there was leftovers, I love leftovers. 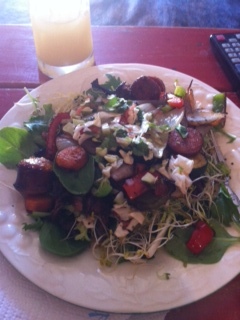 Sometimes the best thing to do with leftovers is to put it on a salad… so I’ve learned. One of my favorite leftover salads is bbq leftover salad. Grilled veggies, fajitas and sausage make for a delicious salad topper. One thing I always put on my salads is a homemade salad dressing. It takes literally minutes to make and is a great healthy alternative to store bought salad dressing. Add all ingredients in a small cup, stir and pour over your salad. You can put whatever seasonings you like. The main thing is to make sure it is one part olive oil and one part lemon juice. The rest is optional. 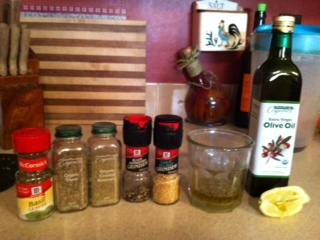 Another salad dressing I like to make is one part olive oil one part raspberry vinegar. It’s perfect for a cranber ry and walnut salad with grilled chicken. The goal is to be creative with your salads or you will get bored with them fast. It’s the weekend! Regardless that I have been off for most of the week, I am still happy it’s the weekend. This past week I went to a beautiful weddings. Congrats to Jorrel and Alisha. So though I had a great time this week with friends… the long nights and drinking really wore me down. So yesterday I came home and did some chakra yoga and meditation and this morning I make a great breakfast packed with antioxidants to help my body recover from all the toxins and not so good for me food I ate. Preheat oven to 400. Take you acorn and scoop out all your seeds. 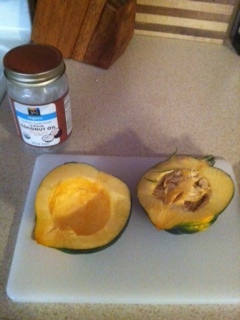 Next spread the tablespoon of coconut oil on it. Place face down on a baking sheet and bake in the oven until tender. Mine took about 20 mins. After your acorn is cooked till tender (you can test this by poking it with a fork) take out of the oven and scoop out all the insides into a bowl. Mash the acorn meat till it reaches a nice smooth consistency. Add the 2 tablespoons of coconut milk. Then the tablespoon of almond butter and mixed till blended. Don’t feel like you have to have every ingredient in order to do this. The main thing that is needed is the acorn meat… once you have that add what you want! Make it your own porridge. 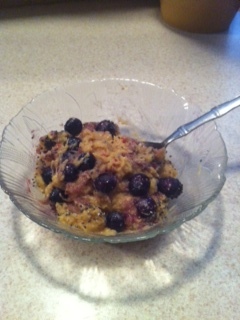 Other ideas of things you can add is a mashed banana, dried blueberries, dried cranberries, dried cherries, fresh fruit, maple syrup, coconut crystals, shredded coconut, nuts, natural jams, etc. One thing I have learned with my new found love for paleo foods is that you have to experiment. It helps you to not get bored with the foods you can eat. When you don’t eat anything processed that really limited your ingredients when you go to the grocery store. We have become accustomed to easy and available but I have found joy and peace in cooking foods I know that are good for me. Now time to go workout with my new kettlebell! 🙂 Hope everyone has a great weekend! Remember to do something for yourself this weekend! The weekend is the best time to rejuvenate and re-energize for the week… so how are you going to do that this weekend?